FIFA opted for a newfangled, alternative selection to host the 2010 FIFA World Cup. No other continent other than Africa would have been contemplated which implied FIFA wanted to compass the appeal of football across an acreage that does not receive the recognition of others. Only few countries put their names in the hat to host the first ever tournament to be held in Africa. South Africa were joined in contest by Egypt, Morocco and a joint bid by both Libya and Tunisia. Tunisia shortly withdrew their interest which left Libya with no choice but to surrender their initial proposal. It was deemed by FIFA that Libya would not be able to sustain the weight of design and expectation from the competition. Without Tunisia in partnership there was concern that Libya would not be able to supply the required resources. With the bidding process narrowed down in terms of contenders to a three-way crusade, the venue for the 2010 World Cup was decided in May 2004. South Africa scarcely missed out on the 2006 World Cup which was awarded to Germany and therefore gave them the upper hand. As a result, South Africa gained the backing of 14 FIFA representatives which was enough to overlook both Morocco, who calculated 10 votes and Egypt who failed to register any support. In confirmation of South Africa’s victory, the late Nelson Mandela emotionally lifted the World Cup trophy into the air to celebrate his country’s prosperous bid. So it began, South Africa had six years to prepare with the density of Europe, both North and South America and Asia overtly glaring over their shoulders, knowing of the host’s lack of experience at entertaining such a large programme. Ten stadiums were planned, five new and five to be renovated, including Johannesburg’ s Soccer City which would be granted the final. Sadly, South Africa did not get the initial backing from a small minority of countries from external real estates. Most notably, former German hero Franz Beckenbauer and Horst R. Schmidt hoisted concerns over South Africa’s planning, methodology and pace in preparation. This built up a small collection of anxieties, including sneaking suspicions that the tournament had been moved to another location. Such innuendos were increasingly denied by FIFA and the South African football federation. Although goal-line technology was being wired in the background of FIFA’s forthcoming plans, its usage through a fast-track campaign was soon to be extinguished by syndicates involved in South African football. This encouraged tournament planners to spread the cost into public transport, security and promotion of the event. Soon after 70,000 construction workers went on strike over reprimands on pay, with many workers walking away with a meager £192 per month. The strike was quickly liquidated but this did not put an end to early controversies behind catering for the large number of tourists visiting from overseas. Poverty and theft in South Africa became notable, whilst concerns with many travelling football supporters being at risk of the victimisation of crime saw the natives stealing goods at will. Security breaches also began to manifest with fans entering both team training camps and privatised ground facilities. One male wormed his way passed security to enter the England training camp which was visited by both Prince William and Prince Harry moments before his goofy escapade. Anti eviction campaigns accrued in numbers to criticise the lack of considerstion for the poor. One example led within Cape Town saw the N2 Gateway housing project, a regime that planned to move more than 20,000 natives and the homeless from the slums to transit camps, along the busy N2 Freeway in order to build rental flats and accomodation for fans in time for the tournament’s initiation process. Authorities went on to backfire remarks by stating that such evictions were common practise in order to ‘tidy up’ the country’s image. This led to a lack of recognition for class, with football being stereotyped as the ‘poor black man’s game’ whilst the ‘wealthy white’ South African’s concentrated on both rugby and cricket, which in turn offered the country their seventh heaven on the sporting front. From a footballing state of mind, the trials and tribulation of qualifcation threw up one of the most contentious routes to the tournament in the European sector. A two-legged play-off between an uninspired French side and an ambitious Republic of Ireland was decided by one of the leading talents amongst his peers. Former Juventus, Arsenal, Barcelona and New York Red Bulls striker Thierry Henry handled the ball in the Irish box to stop the it from exceeding the white line before his assisited cross was buried by William Gallas to seal the tie. Ireland were ruthless and played with affection, holding the French for almost the full two games before Henry graced the ball with his palm. The Irish complained and put forward a request for 33 teams to be involved rather than the novel 32. Ireland were denied the opportunity and thereafter withdrew their appeal despite a clear token of evidence and an ‘honest’ declaration from Henry who owned up to the matter soon after the game. The group stages saw some huge headlines. To begin with, both the 2006 World Cup finalists, winners Italy and runners-up France were eliminated in the preliminary round as both propped the bottom of their groups. In turn, it became the first time in World Cup history that both finalists failed to reach the second round. Italy were generally poor with Marcelo Lippi’s side drawing with Paraguay and debutants New Zealand before conceding three goals in a jarring 3-2 defeat to Slovakia. It was to be the first time Gil Azzuri failed to win a game in a World Cup finals competition. Raymond Domenech’s Les Bleus simply imploded in what was verified as one of the most shameful exits. The French drew their first game 0-0 with Uruguay before conceding to a 2-0 killing by Mexico prior to conceding to host nation South Africa. On top of an under par showing, negative publicity circled the team in their training camp which then had further repercussions back in France. Nicolas Anelka was sent home for being at the centre of the unrest with his manager during the half time period against Mexico. His expulsion saw the rest of the team boycott training before the third group stage game. With an image of a disgraced nation, President of France Nicolas Sarkozy met with team captain Thierry Henry to discuss the meltdown, slowly but surely coach Domenech was relieved of his duties. The South African team went on to set a rather unwanted record by becoming the only hosts ever to be eliminated in the first phase despite putting all their cards on the table. The Bafana Bafana played with a positive profile but a lack of quality saw them fall short by goal difference to the Mexicans, despite winning their third match with divine attacking flare against the French. Initial signs looked reasonably bright in the opening game against Mexico with Siphiwe Tshabalala belting in one of the goals of the tournament, victory came within a whisker as forward Katlego Mphela hit the woodwork with minutes to play. Game two was a trial to forget for the home nation, going down to a 3-0 clean sweep to surprise semi-finalists Uruguay under the brace of player of the tournament Diego Forlan who netted twice, including a spot kick ten minutes from time. With Mexico beating France in game two, South Africa had a mountain to climb in order to advance to the Last 16. Despite a vivacious 2-1 win over the French, the jubilation of such an upset was not enough. The anchors packed their bags early and any optimism was soon blotted out, inviting a taunting vibe from local support for their premature exit. The era under Joel Santana saw some of the darkest days in South African international football, including an early demise from the 2008 African Cup of Nations and failure to qualify for the very same tournament two years later. Carlos Alberto Parreira, in his second spell as coach, restored a short relief, seeing the hosts record a famous win over one of the World Cup 2010 favourites whilst introducing an attacking, risky flare which the fans accustomed to. Parreira soon retired on conclusion of the World Cup and suggested to enforce strong regime to help youth development in the country. Controversies during World Cup games continued into the latter stages of the tournament with the last remaining African nation as Ghana were denied by Luis Suarez and his goal-line saving handball during the extra time period. The score-line stood at 1-1 at the end of regulation time and the Ghanaians were on top. In the dying embers of extra time the Black Stars claimed a free-kick and prized it directly into the box. Stephen Appiah’s initial shot was blocked by Suarez on the line before Dominic Adiyah’s goalbound header was kept out by the then Liverpool striker’s mits. A professional foul was given and the referee pointed to the penalty spot. With Suarez dismissed and the tension on top record, former Sunderland striker Asamoah Gyan rocketed the ball against the crossbar which set the tie up to run the the lottery of a penalty shoot-out. With two short bursts of misfortune, Ghana lost all forms of momentum and confidence, it was from then that the last representative of Africa was elimated after losing 4-2 from the 12-yards. 2010 saw some commodious scorelines, both inherited by the Germans and the Portuguese. Crisitano Ronaldo and co sent North Korea down the bypass with a 7-0 hammering in Cape Town in front of 63,644 supporters thanks to six different goal-scorers. The result recorded the losing side’s biggest ever defeat in what was only their second World Cup, their first back in 1966. Germany turned up their energy levels in the Round of 16 and the Quarter Finals with astonishing scoreboard readings over both England and Argentina. 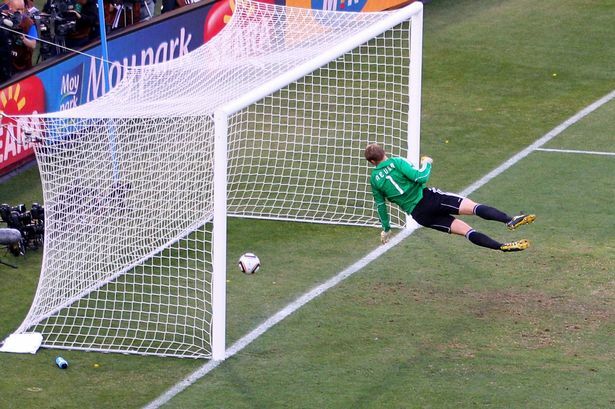 The deliberation for goal-line technology was confirmed in Bloemfontein’s Free State Stadium against rivals England. The Germans took a confident 2-0 lead with goals from Miroslav Klose and Lukas Podolski before the Three Lions switched on prior to half time with a comeback goal from Matthew Upson. A second England wave two minutes later saw Frank Lampard hit a rasping shot from distance, beating Manual Neuer and clouting the crossbar, with the ball clearly crossing the line before the bouncing out of the net rather than hitting the back of it. The goal was disallowed as Uruguayan referee Jorge Larrionda judged the ball to ricochet back onto the pitch and not passed the white line. Despite Fabio Capello’s side contesting the decision in numbers, Germany went on to dominate proceedings after half time with the leading official’s call quite clearly tormenting the England player’s poise. A double from the impressive Thomas Muller following an assist by Bastian Schweinsteiger in a swift counter attack for his first and a penetrating run from Mesut Ozil after latching onto a mistake from Gareth Barry before teeing up Muller for his second settled the score at 4-1, England’s biggest defeat to the Germans at the World Cup stage. Cape Town saw Germany smash Argentina 4-0 in the Quarter-finals with an early nod from Thomas Muller which erupted a second half onslaught to follow, with finishes from Miroslav Klose scoring two and defender Arne Freidrich sliding in to seal a classic performance. Nonetheless, their recreation was cut loose in the semi-finals as eventual winners and tournament favourites Spain secured their final spot with a 73rd minute header from captain Carles Puyol from the resulting corner. Germany took the bronze medal over the Uruguyan’s with a 3-2 victory in Port Elizabeth’s Nelson Mandela Bay Stadium. On to the final and winners Spain met the Netherlands in front of a staggering 84,490 fans in Johannesburg, in the sixth final which included non-former champions. Retired Premier League official Howard Webb took charge of the match at Soccer City which saw two major incidences, with the winning goal proving to be the least spoken of the two. Andres Iniesta sealed Spain’s first World Cup title with a goal in the 116th minute in extra time, seeing Vicente del Bosque’s side become only the eighth nation to win the title and the first to become double champions after lifting the UEFA European Championship trophy two years prior to South Africa. The most critical talking point was due to a hideous challenge by Holland’s Nigel de Jong on Xabi Alonso which connoted similarly to a common midrift kick to the torso in martial arts. The offence was ‘missed’ by the English match officials and went without a booking. The Spanish walked away with £20.3m worth of prize money and a victory over a team who tried to win the title by assaulting the opposition. On reflection, South Africa 2010 as a whole in terms of comments made by major media firms, including broadcasting companies such as the BBC and ITV branded the tournament a ‘disappointment’ due to a number of factors. The standard of football at the tournament was deemed to be missing the flourish expected at such events. Managers and their players were accused of being too defensive and lacking adventure. It had been recorded that 11,000 fans per game failed to utilise their tickets which hampered records. Other points did include Frank Lampard’s ‘goal that wasn’t’ or that it was unusual to have a World Cup where the hosting nation did not progress to the knockout stages. However the most critical pointer above all was the sonance of a horn known as the vuvuzela, a large ‘instrument’ which when grouped together by thousands of its users was deafening. The device was said to have failed football’s awareness by amplifying a racket that blew out what was most important: the action on the field. A host of players raised concerns on the vuvuzela, particular names including Patrice Evra, the French national left back cursed the noise on influencing his team’s poor performance. Lionel Messi went on record to tell of how the horns tampered with communication on the field by all involved, between team-mates, players and staff on the sidelines and by match officials. To add further ammunition a number of commentators said that they felt their voices were being drowned out by the sound, whilst some broadcasters hinted at quietening or removing the ambient noise from the screen to ease the annoyance for viewers. As a result, all vuvuzelas were banned from club football and have not been seen on the international stage since. In a Colin Murray radio slot on talkSPORT, guest presenter and former Liverpool and Germany midfielder Dietmar Hamman branded South Africa 2010 the worst World Cup to date due to the noise and poor displays by those on the pitches. In terms of raising awareness of football in Africa, despite South Africa’s constant struggles on the international stage, the Africa Cup of Nations has come more to the forefront with a larger scale and global emphasis, whilst the influx of imports to big European clubs has been on a continuous rise. Players including Yaya Toure and Didier Drogba have been joined in recognition with the likes of Ghana’s Kwadwo Asamoah of Juventus, Sadio Mane of Senegal and Southampton, Nabil Bentaleb who features in midfield for both Algeria and Tottenham Hotspur and Borussia Dortmund attacker Pierre-Emerick Aubamayang of Gabonese decent. If we are to compare the trend of league football in Africa with some of the most prominent divisions from the rest of the globe, as a continent there is little to suggest that the standard is close to or ever has a chance of matching any other association around the world. In terms of leaving a lasting legacy, South Africa as a nation celebrated with a short smile on their faces. Unlike many leagues in Europe for instance, less than a handful of teams bare any recognition outside of the South African perimeters, with Orlando Pirates and Kaizer Chiefs usually coming to the forefront of any suggestion. With inequality, poverty and social struggles it is hard to see any major overhaul in the near or even distant future. The tournament did provide an economical boost for South Africa and it’s image, which Sepp Blatter moved to congratulate the country on the quality and design of the contest, whilst sporting strong transport and infastructure links. With revenues of £2.24bn, food and merchandise quarters grew significantly, however local businesses languished without a credible turnover. The cost of the 2010 World Cup valued at almost ten times the amount that South Africa spends on treatments for tackling HIV. Since the crowds ceased in numbers, the country has seen the remaining transport facilities go unused, whilst the toll of maintaining stadiums including the Green Point Urban Park in Cape Town is costing taxpayers in excess of £2m a year. The only legacy left it seems is a host of empty, unwanted artificial pitches that even tourists no longer wish to see.